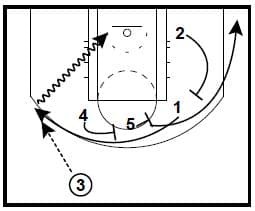 Two end of quarter/half/game/end of shot clock sideline inbounds plays from Billy Donovan and the Oklahoma City Thunder. You will want to put your players in the spots where they can be most effective regardless of whether the positions they play in your system match the traditional numbers that are shown in the plays. The plays are from Billy Donovan’s Oklahoma City Thunder Playbook (assembled by Gibson Pyper). 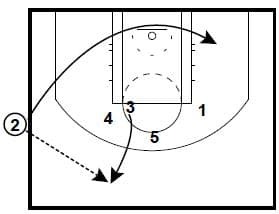 3 sets screen for 4. 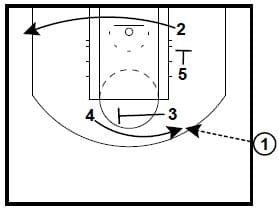 5 sets down screen for 2 who rejects it to opposite corner. 4 fakes hand off to 1 and then quickly attacks. 5 clears to opposite block. 3 cuts to the top. 2 passes to 3 and cuts opposite. 1 Iverson cuts off 4 & 5 looking to attack. 2 sets hammer screen for 5. 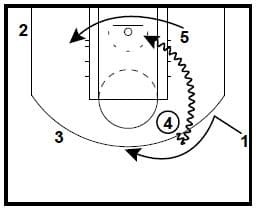 1 drives to score or to make baseline hammer pass to 5.